We specialize in Automotive, Residential and Commercial lock repair! 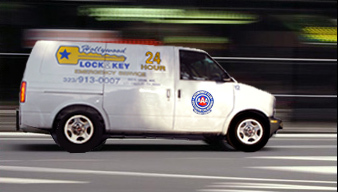 Whether you're locked out of your car, home or office, Hollywood Lock & Key offers emergency locksmith services available around the clock. Our qualified technicians are trained and certified to change, repair and install a variety of different locks and security systems. And for your convenience we offer fast, 24-hour mobile service to go anywhere you are.